Well, the clean up went very well. We had plenty of hard workers to get the dirty job done! We got started around 9:00am Sunday morning by handing out a map to everyone showing the areas in need of cleaning. After everyone had a chance to look it over, they signed in on the sign up sheet. We busted out the garbage bags and rubber gloves and got it on! Mike Vincent was over at west side "Turd Patrol" getting the job done, but not with out barfing at least once! Let me tell you something , cleaning up after sick people who cant take the time to bury their own "You no What" is not fun, but we just can't sit back and look at this once clean and beautiful area get polluted, and do nothing. I was cleaning up the east backside camp areas and came across several "Turd Alleys." We had to clean them, but it wasn't fun. I almost puked. My wife could not handle it and had to take a break and pick up plain old trash! Over in the east side "Turd Patrol" Lance and Gary were doing there part cleaning up. However Lance wasn't such the master after all - he took one close look at a big turd and hurled! He claimed that after hurling, he could handle anything! Gary pretty much laughed! Mike and Vince were on "Canoe Patrol" and cleaned up the islands. They helped unload heavy bags from us, supplied us with new bags, and then hauled the full bags of trash back across the lake, and then loaded them onto trucks. Back at camp there were several people cleaning that area, and then there were about fifteen people working the Little Sluice, surrounding slabs, bypass, and Winch hill area. There was a lot of trash in those areas as well. Since we cleaned out the bottom of the lake last year, and recovered a lot of junk, we decided it was still pretty clean and would not dive it this year. However, there was some garbage along the shore lines and twenty feet out or so. Beer cans and such. So Dana (Lane's girlfreind) put on her snorkel and mask and took care of that problem. The west side of the lake is always the cleanest, I would guess because there are no 4wd trails on that side. But don't get me wrong that doesn't mean there's no trash to be picked up! That's why Larry (Lance's Dad) headed that way armed with a trash bag! Here are some of the things we found that really ticked us off. A complete rear bumper off a truck! I guess it fell off and the person just figured he didn't want it anymore so he would just leave it on the trail. That person is a Jerk! Here's one that really pissed me off, thousands of pieces of broken clay pigeons. These are used at firing ranges, but it seems that some idiots out there think it's cool to bring them up to the Rubicon and practice their shooting skills. Of course we picked up quite a few bullet shells as well! People also leave a lot of trash including tin foil and cans in fire pits. This looks really bad! There wasn't a campsite that didn't need a good cleaning. Belive it or not some campers were acually packing up and leaving as we were working at the camp site next to them, and when we got over there they had left us a pile of garbage to pick up for them, and their broken barbeque! The biggest problem we had was the toilet paper and " turds". They were everywhere! It's just plain sick. If we can just get people to care more about the trail and the land, we would all be a lot better off. Please use a shovel to bury your "turds", and don't do it near or down stream to the lakes. Also, you haul it in, you haul it out! That's not to hard to remember. Not more than two hours after our groups cleaned the "Little Sluice" area several groups of four wheelers came through and left trash all over! Unbelivable! Right before my very eyes, trash was all over the granite slabs. It looked like we had done nothing! So we picked up the trash, bagged it, and headed home. All in all it was a big success! We hauled out about twenty five large bags (44 gallon bags) of trash. We had Brandon's Toyota truck full of bags, and Hollis's truck too. Several of the other rigs had a few bags packed in as well. I want to thank everyone who helped us out, including several people who didn't sign in on the sheet, but I saw them out picking up trash. 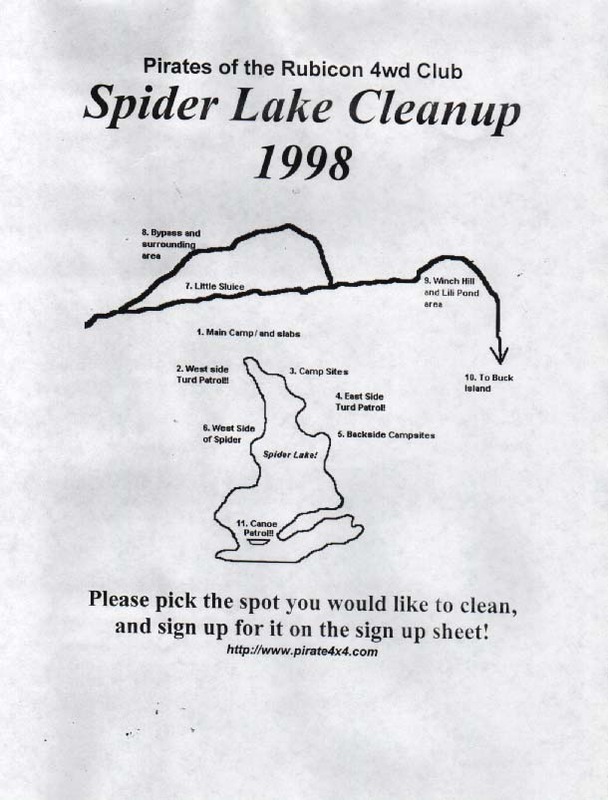 Click here to see our 1st annual Spider Lake cleanup!